In symphonic terms Franz Anton Hoffmeister occupies that period between the genres flourishing with Mozart and Haydn, and its weightier place in a composer's output that we associate in the symphonies of Beethoven and beyond. Stylistically these symphonies are more akin to the Classical models of Haydn, so if you are a big fan of those symphonies this will very much fit in with others from the great master. 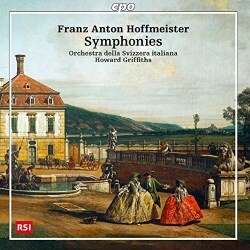 Of the many that Hoffmeister composed forty-four symphonies have so far been identified, at least forty-two of these having been composed by 1792. The symphonies on this recording appeared a decade later and are amongst the last known from his pen. Popular enough to be chosen for repeat performance by the Gewandhaus in 1802, the Symphony in D major is a good humoured work with plenty of wit, disguising some quite innovative compositional techniques that are pointed out in some detail in the booklet. Expanding expectations, Hoffmeister pays a lot of attention to his inner movements, and the Andante cantabile second movement and Menuetto third are filled with variation and surprise. You can let this flow over you like a relaxing balm, but as with all good music the closer you listen the more there is to discover – little harmonic twists and rhythmic shifts, and a melodic facility as easy as water running from a tap. The earlier symphony is presented last, its rousing Allegro con brio conclusion a suitable finale to the programme. The last of Hoffmeister’s known symphonies is the Symphony in C major, which has just about everything in it you could ask for in such a work short of having the name ‘Beethoven’ on the title page. An eloquent and dramatic Adagio introduction fills out the first movement to make it the longest here, its sustained notes introducing at one point a real sense of mystery and tonal disorientation. The throwing around of and development of ideas further along in the movement also point towards the 19th rather than the 18th century, and while the underlying mood always brings us back to sunshine and laughter there are plenty of stormy moments along the way. Once again the central movements are filled with fine ideas, with rich orchestration in the Andante adding to its easy-going and elegant appeal, the Menuetto and Trio even having some salon-like schmaltz with a violin solo halfway through. The final Allegro is distinctly perky and crammed with activity, if not perhaps with the best thematic ideas in the whole piece – it makes up in energy what it misses in memorable moments. For once an orchestral CD that actually starts with an overture, that for the opera Der Königssohn aus Ithaka which was Hoffmeister’s most successful stage work. The influence of Mozart is clearly apparent but again this has plenty of innovative features, and a huge amount happens in its brief four-minute time-span. With an excellent recording and very good performances by the compact but full-sounding Orchestra della Svizzera Italiana this has been quite a surprise hit when it comes to relatively obscure composers and their unknown symphonies. With full documentation in small print this is both an education and an entertainment.